Weird and wonderful sounds from outsider to weird covers and occasionally painful stuff from the Golden Age Of Stupidity. Four layers of 1960s Japanese pop sandwiched between some strange, unidentifiable bread and extras. Hey hey! Checking in from soggy LA. Any covers of "It Never Rains in Southern California" today Spacebrother? There should be. Dammit. I have three! I want whatever that sandwich thing is. Looks like the stuff they serve in froo-froo "British" tea houses. I stick with a pint of Bass. 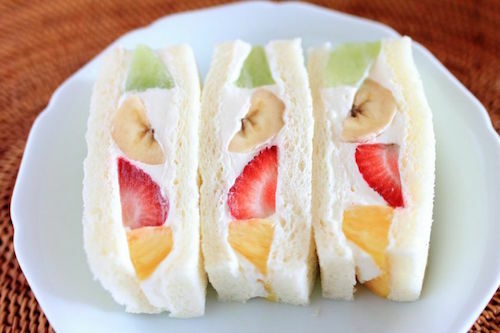 It's the image I got when searching "Japanese sandwich." Uh, it's after start time. Still hearing the autoplay. I want to make that sandwich, with yogurt. 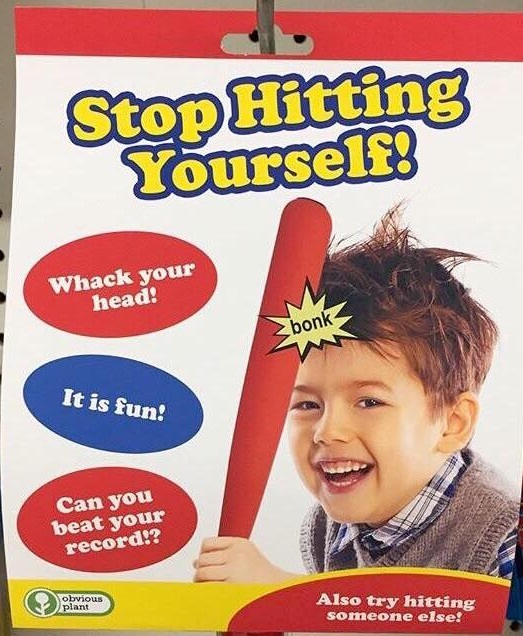 Ha, love that graphic for the Stop Hitting Yourself game. This track just reminded that someone put a bunch of children's records in my mailbox at the radio station. I plum forgot about them! Hey, are we in the Pink Pussycat Lounge?! I just went willy-nilly this morning when I found I had less time than usual to record a show. Streaking 70’s style! Impossible at 29 Fahrenheit! I wonder if there are still nudists. And "nudist colonys". Jokes about em were a staple of comedy for years. Yes, I saw one a couple of years ago during a hike. Kind of disconcerting. Willy-nilly is my favorite radio format. Also hugger mugger. They were called an "alternative community" according to their sign out front. Waving bended spoons in the air, like lighters at a rock concert. We've got one on the banks of the Columbia River, just outside of Portland. It's a muddy mess. I guess cartoonist Bill Plympton was notorious for throwing huge naked parties there. I always loved Phil Proctor's take on him - Nino the Mindbender. Me too, I think i like Nino better. Oh wow! A Japanese version! I am still looking for the whole record. I think there's a German version too. It was "Nino the Great Mindboggler" I think. Are the 5678’s on this track? How many different language 'Cast of' Hair albums are there? I only have the French cast one. I played some after I learned Galt McDermott died. You're right, Greg. I just googled it because I couldn't remember. I was actually surprised how many original cast recordings of the "Rocky Horror Picture Show" stage show there are. In different languages, that is. I think that April Winchell had a bunch of tracks from different cast versions. Not complete albums, I don't think. Maybe that's where I heard of them. Oh, Rocky Horror would be cool. I have the motion picture version and the original stage show album, and that audience partici-pation album, but that's it. I have a various artists punk tribute to Rocky Horror. There's a site with a collection of info, if not audio links. See, this is the kind of stuff we should be hearing diegetically in Man in the High Castle! It would be funny if they used to be the 1234s. Also met a koo koo Japanese cartoonist named Assman Ono who did a Devil Dogs cover too Choad Blast I believe Crazy party with Guitar Wolf too NYC/JAPAN!! Ah, but there IS another singing psychic, Jean Baskervile, the Singing Psychic! Oh yeah! I might have something by her. Probably from you. He's sort of like a Beta (Russell) Mael. Never thought of that. Yes, he does! This is cool. I've heard of him, but have never actually heard him until now. My wife is annoyed that I have been listening and singing Arvedon around the house lately. I do that too, Mr. Fab. God I remember hearing this on KBOO back in the day. This goes well with Hybrid Kidz, Flying Lizards and Silicon Teens. THanks Otis, any stumps this time? Love this Bakersfield Boogie Boys EP. Wish theyd recorded more than 4 songs! Yeah, they probly weren't from Bakersfield, of course. Wonderful show today, spacebrother! Thanks! Will we get cut off? I kept this one to exactly 1 hr. It does mean a lot when people I respect enjoy what I do. Nothing prepared me for how weird the original Casino Royale was. You can't prepare for it. It's psychotic! Actually, "schizophrenic" would be a better word. Changed the listing for the 'Casino Royale' singer to "Mike Redmond" as per Eric K., who pointed out that it wasn't Peter Sellers singing.